Created by Alan Fitton on May 7, 2012 5:52 AM. Last modified by Alan Fitton on May 8, 2012 2:46 AM. This article documents the process of porting the seam 3 hotel booking example to use Hibernate OGM with MongoDB as the datastore. Note that this will need the parent 'examples' pom and the toplevel seam pom below that for the maven build to work. See below. JBoss Enterprise Application Platform 6 beta. These instructions should work for the community AS 7. I'm using the MongoDB OGM dialect, but these instructions should apply to the infinispan or ehcache backends with some minor changes to the configuration. This is based on the booking example in the seam github at the time of writing. The 3.1.0.Final example had issues. Using Hibernate OGM git master at the time of writing (the mongo dialect has not been released yet). Install MongoDB. No real configuration is required on Fedora - just 'yum install mongodb-server' and 'service mongod start'. Clone the OGM sources, build and install into the local maven repository. Create a directory for the OGM module. Copy OGM core, the dialects, and the MongoDB java driver into this module directory. [alan@ajf-rh ogm]$ cp ~/jboss/hibernate-ogm/hibernate-ogm-core/target/hibernate-ogm-core-4.0.0-SNAPSHOT.jar . [alan@ajf-rh ogm]$ cp ~/jboss/hibernate-ogm/hibernate-ogm-infinispan/target/hibernate-ogm-infinispan-4.0.0-SNAPSHOT.jar . [alan@ajf-rh ogm]$ cp ~/jboss/hibernate-ogm/hibernate-ogm-mongodb/target/hibernate-ogm-mongodb-4.0.0-SNAPSHOT.jar . [alan@ajf-rh ogm]$ cp ~/.m2/repository/org/mongodb/mongo-java-driver/2.7.2/mongo-java-driver-2.7.2.jar . Create the module.xml (in the same ogm module directory). Ideally we would probably split the dialects into separate modules, but lets keep it simple. Clone the seam booking example from the seam github. There was an issue with the 3.1.0.Final example at the time of writing. Maybe a future release will be ok. If you don't feel like doing the refactorings and just want to try it out, you should be able to clone the project from my github into the examples directory. Update persistence.xml. Note the lucene index directory will need changing. OGM does not currently support criteria queries, which the booking example uses. 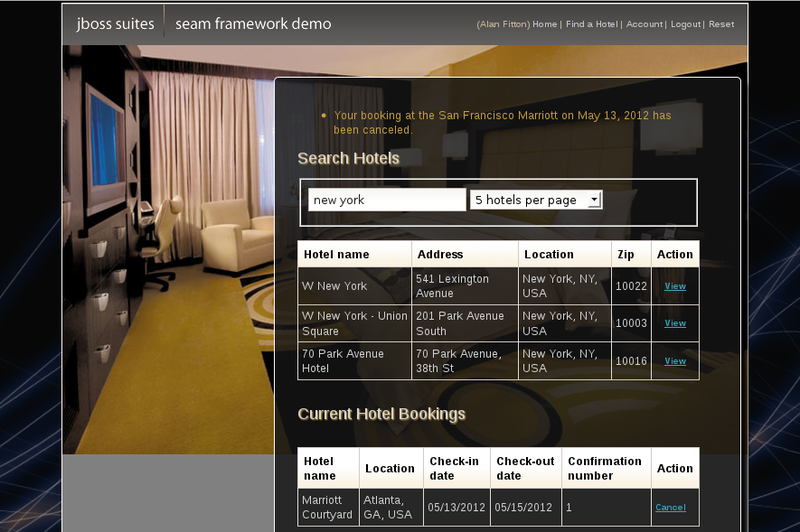 There are two queries in the example - the action which searches for hotels, and the one which finds a users bookings. Create an eclipse project and then import it to make the code changes. Create this class, org.jboss.seam.examples.booking.cdi.FMEMProvider. This allows a FullTextEntityManager to be injected into our action classes. We need to add @Indexed annotations to the entities which need indexing by Hibernate Search. @Field on the fields which need indexing, and @IndexedEmbedded to create the embedded index allowing us to search on booking.user. Refactor the HotelSearch class to use hibernate search. Start by adding the FullTextEntityManager (which is injected by the FMEMProvider defined earlier using CDI/weld). Replace the queryHotels method with one which uses Hibernate search and lucene. You could experiment with the lucene queries here. final FullTextQuery query = em.createFullTextQuery(luceneQuery. Build the war and deploy it to the application server. Start the application server. I found there are a lot of harmless exceptions caused by CDI/weld, which can be ignored. Note that when you search for hotels, unlike the original example, this only matches full keywords (case insensitive). Try typing "hotel" or "marriott"